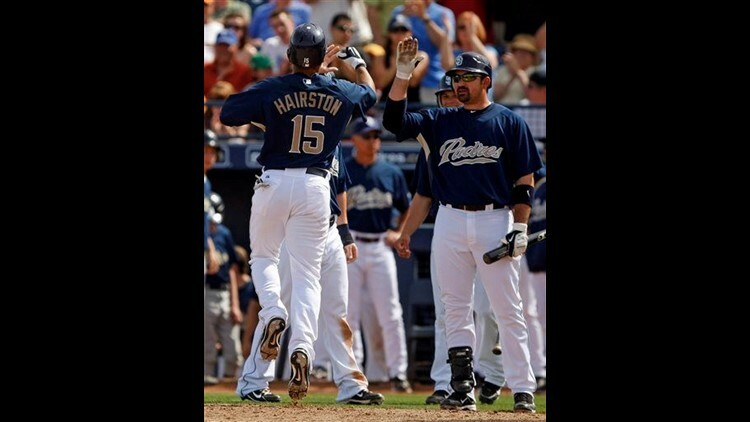 PEORIA, Ariz. (AP) — Jerry Hairston Jr. hit a three-run homer to cap a six-run rally against Rich Harden and the San Diego Padres beat the Texas Rangers 14-5 Sunday. After pitching three scoreless innings, Harden couldn't escape the fourth, leaving with two outs after giving up a double, triple, home run and walked in a run. Harden allowed six runs on seven hits and three walks in 3 2-3 innings. Hairston and Adrian Gonzalez each had two hits for the Padres. Padres starter Sean Gallagher also had a tough day, surrendering five runs in the third inning. Gallagher didn't walk a batter but allowed five hits over four innings, including a three-run homer to Nelson Cruz. Michael Young also had two hits for Texas.